A new baby is a lot of work, and certain accessories like a bottle warmer best prepare you for those sleepless nights. They are timesavers and are extremely easy to use. Economically speaking, they do not break the bank. To help you find the top bottle warmers, we researched a variety of new and best selling products. 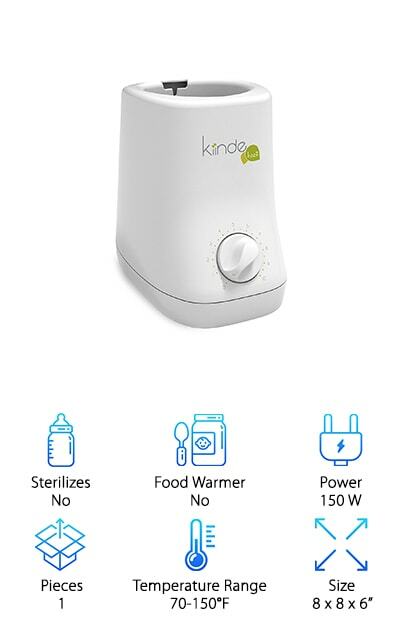 The result is the top ten baby bottle warmer reviews below. Now: Before we get started, here’s what you need to know when shopping. Sterilizes: Some of the bottle warmers for sale chosen by our reviewers pull double or even triple duty. Baby bottles can be tough to clean, so check to see if sterilization is on the list of services provided by your favorite warmer. Food Warmer: Babies begin sampling food other than breastmilk or formula by around 6 months of age. That’s why it is so helpful to have a bottle warmer that also gently warms purees or rice cereal. You can prepare an entire meal. Power: Some warmers are petite, taking up little room on a kitchen counter. Others are sturdier and can be used to prepare larger servings. We note the wattage for each warmer so you get an idea of its power. Pieces: Some of the items in our top ten list are standalone baby warmers. Others come with extras that are also very helpful in your quest to create wholesome, nourishing baby treats. We let you know how many pieces are included. Temperature Range: Think of this as a minor safety check as you move forward with acquiring your bottle warmer. Understanding the temperature range will help you in creating the ideal settings for your baby and their bottles. Good to know, right? Size: The size of each and every bottle warmer is given in inches. With an understanding of the height, width, and depth of each of the best bottle warmer choices on our list, you are armed with a little more pertinent information. Now that you know how to choose a great bottle warmer, let’s get right to the reviews. Here’s the deal: If you’re in a hurry, take a look at the top pick and the budget pick. Both are fantastic products and are among the very best bottle warmers we found. Right below, you’ll find all runner-ups in our bottle warmer reviews. If you’re looking for the best baby bottle warmers, they are on this list. Let’s get started! 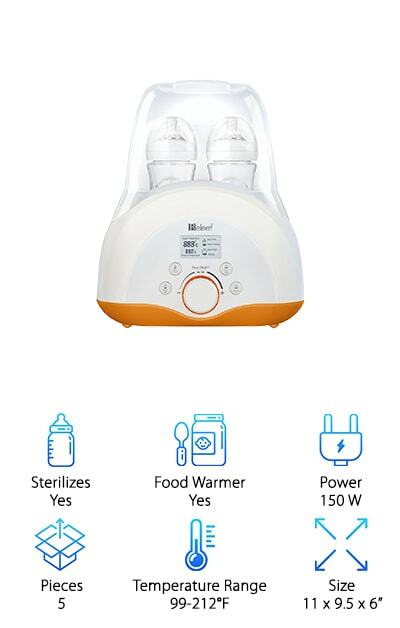 So many features, so little time with the Babebay 4-in-1 Bottle Warmer! You no longer have to guess about the temperature of your water or your milk. It displays the temperature right there on the LCD screen. And when your bottle reaches the temp you set, the heating mechanism stops. Automatic insulation kicks in to preserve the warmth you are looking for. 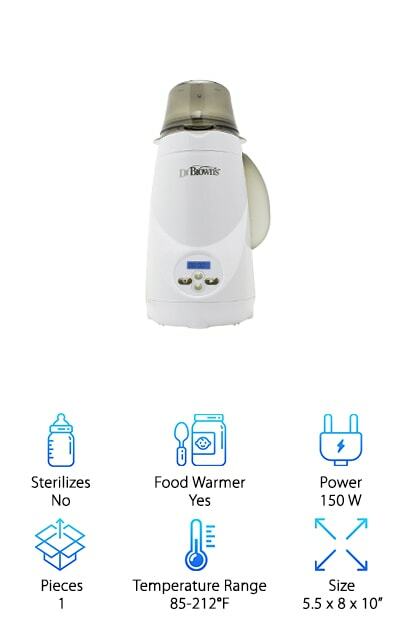 It gets better: The Babebay is also a sterilizer, and a food warmer. Sterilization happens at the highest heat, which is why it has a range of 99 to 212 degrees Fahrenheit. The best rated bottle warmer also accommodates food, and this also heats up in a water bath for gentle improvement. The Babebay shuts off automatically for safety reasons after a certain amount of time. It is designed not to leak, and the base is anti-skid so that it stays put on your countertop. It stands 11 inches tall and almost 10 inches wide, and 6 inches deep. Babies are hungry at all hours of the day or night, when you are trying to do laundry, or put them to bed, or get out the door to work. It is never a convenient moment, so why not buy a machine that will help with the inconvenience? Our budget pick is The First Years Bottle Warmer. The best bottle warmer reviews would not be complete without it. Why? The first reason is sizing. Wide, tall, and even angled baby bottles fit inside the opening to be warmed up gently. It is made from BPA-free plastic, just like all of the bottles you are using. It has no latex, PVC, or phthalates. In minutes, you’ve got formula or breastmilk heated all the way through without reaching dangerous levels. Need more from your bottle warmer? No problem. It also sterilizes pacifiers. The typical parent has pacifiers lying around all over the place, and getting them sterilized is a pain. Never again! Picture this: It's 1 AM, and your child or children are wailing for milk. You've got the baby in your arms, and you need to move quickly to get this little one fed, and back into bed. 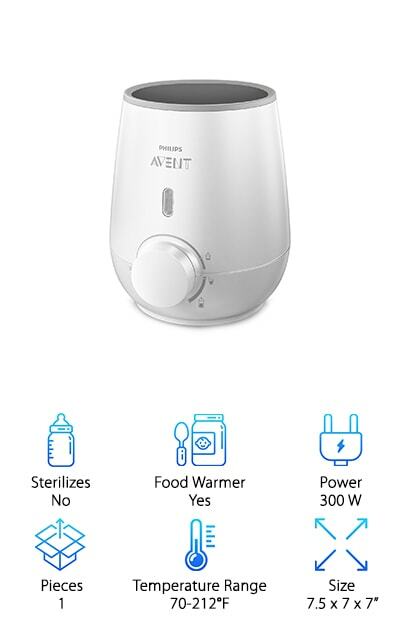 It's time to grab the Philips AVENT Bottle Warmer. It is from the same people who make some of the most popular baby bottles on the planet! Our bottle warmer reviews are comprehensive, and helpful because these purchases save you time and money. The AVENT warmer is no exception. Here’s how it works: Both plastic and glass bottles are safe to use in this warmer. Select your milk and your bottle, get it ready, and then place it in the center opening. Add a little water, and then turn the large dial to the right setting. A neon light tells you it’s working, and the included reference table gives you the proper timing. When it chimes, test the bottle and hand it over! One thing that irritates some parents about bottle warmers is the need to prep the warmer with water before every use. This is not necessarily the most efficient method, which is why the Dr. Brown’s Deluxe Bottle Warmer is so great. Water placed in the receptacle will last through several uses, so you can get the warmer ready for overnight use the day before. The best bottle warmer for breast milk will not scald or overheat. The Dr. Brown’s warmer offers both audio and visual signals that the bottle is done and ready to serve up to your hungry little munchkin. The warmer includes an adjustable basket, so you can change it to fit the bottles you like best. You don’t need to use Dr. Browns bottles, although they are incredibly popular! If your son or daughter is transitioning to solid food, there’s a setting for that as well. Warm up homemade or ready baby food so they love every bite. The folks at Boon want you to feel cool as you warm up your baby’s next bottle. That’s why they designed the Boon Orb Bottle Warmer, a sweet little piece of eye candy that will take up next to no room on your kitchen counter. It is a circular warmer, measuring just 5.5 by 5.5 inches. The bottle or storage bag of breastmilk goes into the opening at the top, along with the correct amount of water. The heating mechanism at the base steams up the water and gets things warmed up safely. If your child is graduating from formula or milk to baby food, that’s OK! The Boon Orb comes with a basket for placing jars of baby food. They also get warmed up quickly, without fuss. We wish we could say the same for your kiddo! The base of the Boon Orb is non-skid. It won’t slide around on you. It is also BPA-free, PVC and phthalate-free. The folks at Kiinde follow CDC and USDA guidelines to warm up whatever you place into the reservoir. There really is a wide range of options, including jars and bottles (both plastic and glass,) and storage bars. The creators behind the Kiinde warmers are parents, and they are also MIT-educated scientists. They wanted to create something that would not burn or scald food but gently heat it up instead. It does so with a warm flowing water bath. The water comes from a receptacle that stores the extra liquid in between uses. It does not have to be refilled every single time. Convective heat gets the water going instead of steam, which can be dangerous. When the time's up, automatic shut off turns the heat off completely. This warmer measures 8 by 8 by 6 inches, and will fit most baby bottles. Even storage bags that were laid flat to freeze can be placed inside and thawed gently. 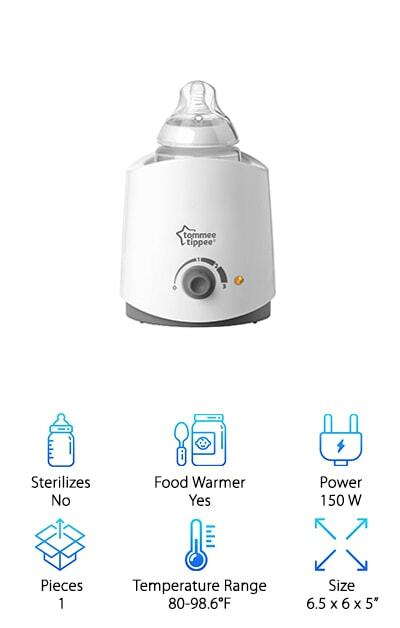 The Munchkin High Speed Bottle Warmer is actually a set of 3 pieces, designed to fit most baby bottles from small to large. In addition to the sturdy warmer itself, there is also an adapter ring for smaller bottles. There is a built-in measuring cup and a basket to assist you with lifting everything out. No need to burn your fingers while getting baby fed and happy! The alternatives to a good warmer are the microwave or a pot on the stove, and both methods are dangerous and time-consuming. With the microwave, you are constantly playing a guessing game. With the stove, you are hovering over a hot flame, often with the child in your arms. Neither scenario is ideal. 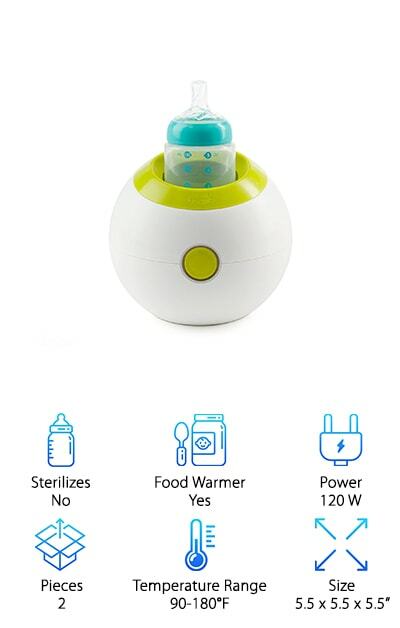 The Munchkin warmer has an on/off indicator and an automatic shut-off feature when the timer completes its cycle. Measurement markers on the side help you to know how much water to add. You’ll be prepping perfect bottles in no time! 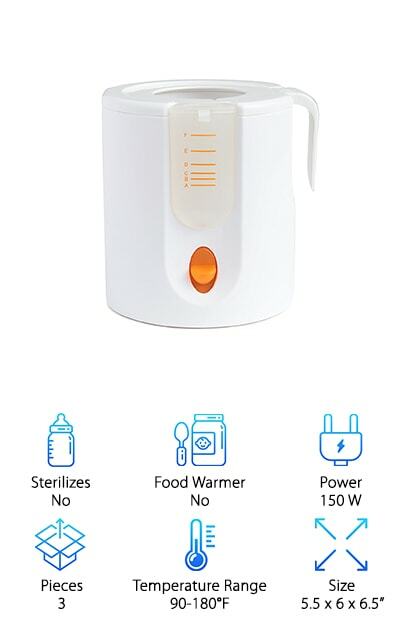 Comprehensive baby food help on the go – that’s what you get with the BEABA Baby Bottle Warmer. It is also quick, and time savings is of huge value to anyone caring for a hungry infant, baby, or toddler. The first thing you need to know is its capacity for sterilizing bottles. This can be a huge pain: Boiling water, setting a timer, and waiting for bottles to cool. 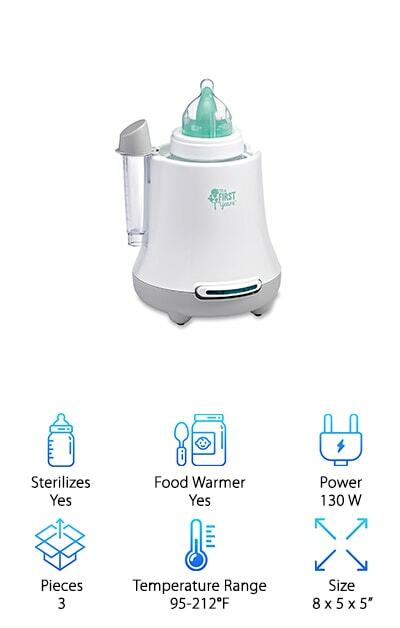 Instead, you just add the right amount of water to the BEABA Baby Bottle Warmer, place bottles of any size on top, and let this machine do the work for you. Once you have a bottle suitable and ready for feeding, you can also get the formula or breastmilk prepped. In less than five minutes, you will have a bottle that is not too hot, and not too cold. 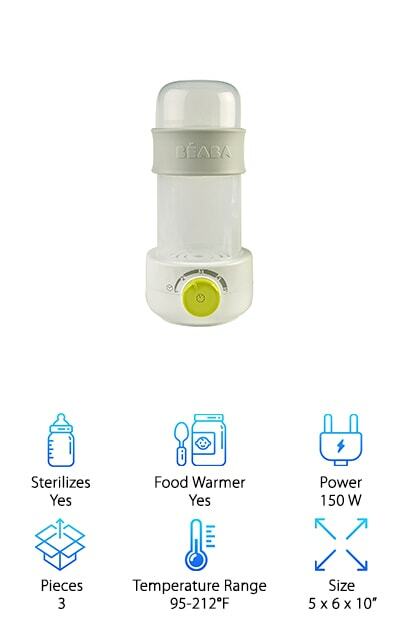 Finally, 3-in-1 functionality means the BEABA can also warm up baby food. It weighs just over a pound, and it’s easy to transport! A bottle warmer buying guide is never complete without something like the Tommee Tippee Electric Warmer. It is one of the best rated bottle warmer purchases out there, and we will tell you why. To begin with, Tommee Tippee is synonymous with quality. They make some of the most popular baby bottles on the market. Now, you can invest in a warmer with the same focus on excellence. The Tommee Tippee Warmer boasts a slim and sleek design. It measures just 6.5 by 6 by 5 inches. You can pour water as needed directly into the same opening for the bottle, no need to deal with a separate reservoir. It is also safe enough to use with storage bags, fresh from the refrigerator or the freezer. Our reviewers also love it because it makes heating up food so easy. That transition around 6 months of age will go more smoothly with this warmer by your side. Try it out today! Our next pick is so much more than a bottle warmer. 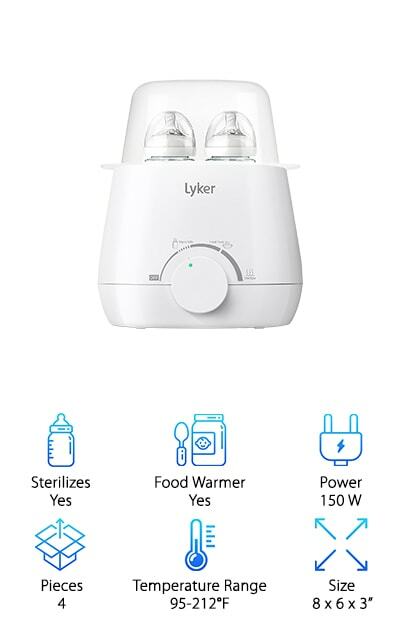 With one machine, called the Lyker Baby Bottle Warmer, you obtain three different processes. The first is bottle warming, and it is important to note that bottles can be warmed from the fridge or from the freezer. This bottle warmer is designed so that bottles are warmed evenly, without hot spots. Bottles can also be warmed from room temperature, they will just be ready faster. Then it can also sterilize small bottles. Moms and Dads know what a pain it is to get all of those little things clean, day in and day out. This is such a timesaver! Finally, it warms food too. Oatmeal, fruit and vegetable purees, whatever your child is enjoying that week can be heated without destroying nutrients. The Lyker Beleef Warmer is really three devices in one. There are accessories, too: A bottle brush and tongs. The tongs are very helpful with warm milk!